What does the ascent of Sebastian Kurz say about the Austrian political landscape, and the state of European parties in general? Last December, a sigh of relief could be heard in Brussels as well as Vienna when the Green Party’s Alexander Van der Bellen defeated Norbert Hofer of the far-right Freedom Party (FPÖ) in the Austrian presidential election. It seemed as though the coming of a new dark age of populism and nationalism might be averted, and that a string of debacles for Western liberal democracies—from the Brexit referendum to the election of Donald Trump—had finally been broken. As it turned out, Van der Bellen’s triumph was the beginning of a new era of political volatility in Austria. In the presidential election, no candidate from either of the two ruling parties, the conservative People’s Party (ÖVP) and the Socialist Party (SPÖ), advanced to the second round. It was a crucial development in a country where these two juggernauts have been in power, either in a “grand coalition” or separately, for most of the last 100 years. Moreover, Austria’s electorate boasts the highest percentage of party membership among all the countries of Europe. The reason is that the ÖVP and SPÖ are much more than political parties: They are corporations ready to secure the interests of their members and sympathizers, rewarding them for their loyalty with jobs and subsidized apartments. The failure of the ÖVP and SPÖ to qualify for the second round represented more than just a local crisis. It was a sign of a broader social change that was also evident in the recent French presidential election, in which the previously dominant Socialist and Republican parties were likewise shut out of the second round. Van der Bellen’s victory suggests that even Austrian voters, long faithful to their traditional parties, are increasingly at odds with left/right labels and hungry for a political alternative. Sebastian Kurz has been auditioning for that role for several years, and on May 15 he laid claim to it when he took over the leadership of the ÖVP. To call Kurz a rising political star would be an understatement. In 2011, at the age of 25, he was appointed to the new position of state integration secretary; two years later, he was elected to Parliament with the largest number of direct votes and was also appointed foreign minister—the youngest in the world. 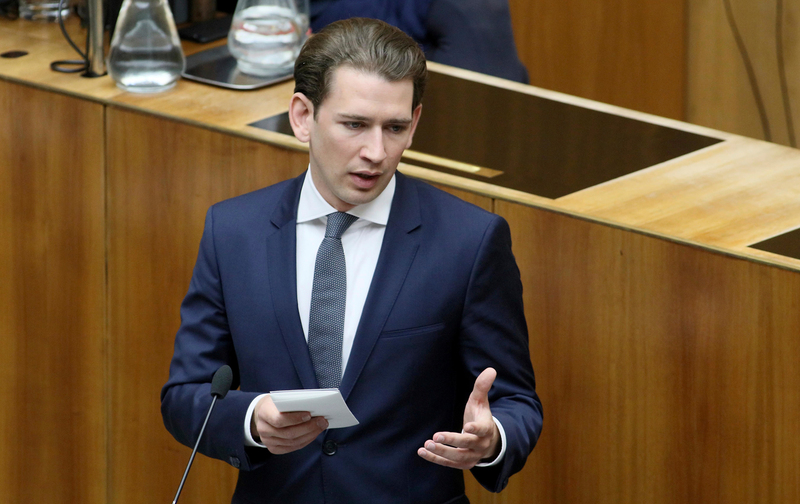 Already very popular, Kurz saw his approval ratings improve in early 2016, when he started negotiations that led to the closing of the so-called “Balkan route” that refugees had used to enter Europe. Kurz was suddenly seen as an important counterweight to German Chancellor Angela Merkel—a polished and urbane European politician willing to oppose Merkel’s “open doors” policy with arguments at the negotiating table, rather than with the barbed wire and tear gas favored by Hungarian Prime Minister Viktor Orbán. Kurz’s arguments for closing the Balkan route were simple but carefully worded. To this day, Austrians repeat his catchphrase “NGO Wahnsinn” (“NGO Madness”), a label for NGOs that contact smugglers in order to save migrants from sinking boats. These NGOs provide a perverse safety net for the smugglers, Kurz argued, and their strategy is doubly self-defeating: The smugglers are not only encouraged to cram more people into boats that are provided with less fuel (thereby increasing their profits), but the refugees are encouraged to stick with the smugglers’ services, because they can count on being rescued by NGOs operating in the Mediterranean if something goes wrong. Shortly after the Balkan route was shut down in March 2016, conditions in the refugee camps along the route deteriorated drastically because of overcrowding. Kurz, however, believed that such short-term costs were necessary to achieve a longer-term solution. Yet he ended up ditching some important principles along the way. As state secretary for integration, Kurz had been the face of Zusammen Österreich (Together Austria), a campaign that gave schoolchildren the opportunity to meet and talk with highly successful immigrants living and working in the country. It wasn’t new terrain for Kurz: As the Austrian weekly Profil reported, he had firsthand experience with refugees as a schoolboy, after his parents took in a Bosnian family that had fled the war in the former Yugoslavia. For some Austrians, Kurz’s hardening political stance toward migrants is a calculated maneuver meant to peel away voters from the far-right FPÖ and beat it at its own game. This suspicion has led many of the so-called “ambassadors of integration”—the successful immigrants who had joined the Together Austria campaign—to distance themselves from him. For others, though, Kurz is forging a promising new political platform similar in style, energy, and aura to En Marche, the movement that France’s Emmanuel Macron rode to the Élysée Palace in May. For months, Kurz has been leading the polls in popularity and job-approval ratings. As the Austrian political magazine Trend reported, even the former leader of the ÖVP, Reinhold Mitterlehner, was prepared to hand him the party’s reins. The problem was that Mitterlehner wanted the ÖVP to continue as a governing partner in a grand coalition with the SPÖ, whereas Kurz and a handful of powerful party figures worried that remaining in the coalition would weaken the “Kurz effect” before the wunderkind could lead the ÖVP to electoral victory. The ÖVP’s changeover was staged to appear as though a tired and moderately popular party boss had decided to step down and a young, energetic newcomer just happened to be waiting in the wings. But what transpired was actually a carefully orchestrated palace coup, preceded by a series of long, secret talks and undertaken with solid assurances of support for Kurz from local party bosses. Kurz’s takeover of the ÖVP is typical of how he does politics. In public, he projects an image of frankness and composure, of being able to react to challenges quickly and with a cool head, while also favoring pragmatic, common-sense solutions that can appeal to those willing to abandon narrow ideological categories or old party allegiances. But behind the scenes, Kurz’s rise has been accompanied by an enormous amount of planning, negotiating, and scheming. Kurz declares on his official Facebook page that “Ich bin ein Freund der Klarheit” (“I am a fan of clarity”), but he is adept at dodging people like Peter Klien, the popular comedian on Austrian TV who chases down politicians and asks them piercing or inconvenient questions. Thus far, Kurz’s political strategy and carefully honed public image seem to be garnering support. With Kurz as the face of the ÖVP, the party climbed from third place to finish first in a recent opinion poll (with 33 percent), and Kurz is now the presumed favorite for the Austrian chancellorship. An immediate side effect of Kurz’s palace coup was the siphoning of support from the FPÖ. After the first wave of refugees arrived in Austria in 2015, the FPÖ’s advantage in the polls over the two major parties grew significantly—but now it trails both. For some, this is reason enough to give Kurz a pass for not formulating an overall political vision. As the German daily Süddeutsche Zeitung sardonically noted, some Austrians believe that Kurz’s only issue is the refugee crisis. Even so, he still attracts moderate voters back to the center-right mainstream. Moreover, the FPÖ’s leader, Heinz-Christian Strache, will likely never become chancellor; he continues to lag in opinion polls far behind not only Kurz but also the current Socialist chancellor, Christian Kern. Ironically, though, as Conrad Seidl of the Austrian daily Der Standard has observed, the FPÖ’s chances of entering the government haven’t looked this good for quite some time. With Kurz’s coronation spelling the end of the grand coalition between the ÖVP and SPÖ, early elections have already been announced for October 15. The campaign will surely be marked by the rivalry between Kurz and Kern, the two strongest contenders. Unless the winning party garners the majority of the seats in the lower house of Parliament, it will need to form a coalition government—making the FPÖ a valuable potential partner for either the ÖVP or SPÖ. In short, a political gambit based on the FPÖ’s declining popularity could very well end with the far-right party in the governing coalition no matter which major party wins. And so the question remains: Is Austria’s new political wunderkind promising the end of ideology, only to allow its more appalling manifestations to creep in through the back door? Paweł MarczewskiPaweł Marczewski is a sociologist and political commentator based in Vienna. He is a contributing writer at the Polish weekly magazine Tygodnik Powszechny.